INDIAN GIVER is in partnership with Craft Ontario and Culture Storm. This exhibition of commissioned works addresses issues of cultural appropriation through fashion, textiles and wearable art with curatorial vision by Erika Iserhoff and Sage Paul, founders and directors of The Setsuné Indigenous Fashion Incubator. The established and emerging artists include Erika Iserhoff (Erika Annie) (Cree), Jodi Lynn Maracle (Kanien’kehá ne Kenhtè:ke – Mohawk of the Bay of Quinte), Jeneen Frei Njootli (Gwich’in) in collaboration with Rodrigo Hernandez-Gomez (Nahua/Mestizo), Sage Paul (Dene), Lido Pimienta (Wayuu), J'net Ayayqwayaksheelth (Nuu-chah-nulth), and Louise Minowinsetchketkwe Solomon (Ojibway). Bay of Quinte). Recent media has been flooded with incidents of cultural appropriation: Urban Outfitter’s illegal usage of the Navajo Nation’s cultural trademarks, the Washington Red*kins logo and name, and Canadian designers Dsquared2’s fashion collection D*quaw, to name a few. While these cases have been recognized as derogatory or racist, there are initiatives in the mainstream that are Indigenous-led and truly share in celebrating our culture, history, aesthetic, or contributions to modern day. This seminal exhibition, Indian Giver, addresses the disjointed “appreciation” of our culture and the theft of intellectual property, traditional knowledge, cultural expressions, artifacts or traditional materials by reclaiming these ideas and placing voice and creation squarely back into the hands of Indigenous artists. Until June 2016, these artists will work independently and collaboratively to create a new body of works that speaks to and challenges cultural appropriation of Indigenous peoples. The works will have a foundation in fashion, textiles or wearable art although the selected proposals explore mixed materials and practices in their execution. In addition to working together, Artists will have access to consultation with our selection jury, elders, OCAD University and Craft Ontario. This body of works will be exhibited for two weeks in June 2016. Please stay tuned for more details. Erika Iserhoff (Cree) is a Toronto-based multi-disciplinary artist and a recent graduate of OCAD University who works to bridge her Indigenous cultural knowledge with contemporary approaches to creating art. She is also a costume designer and the recipient of a Dora Mavor Moore award for Outstanding Costume Design for the play Agokwe by Waawaate Fobister (Buddies in Bad Times Theatre). Erika is the Artistic Producer of Native Women in the Arts and Co-Founder of Setsuné Indigenous Fashion Incubator. Jeneen Frei Njootli and Rodrigo Hgz peoples both in the North and the South are renown for creating incredibly inventive and beautiful garments. Jeneen and Rodrigo are inspired by the wearable art made by their ancestors and families hands. They hope to honour their respective traditions by giving continuation to the values enacted in creating hand made, imaginative, playful and meaningful wearable pieces and adapting them to our particular circumstances. 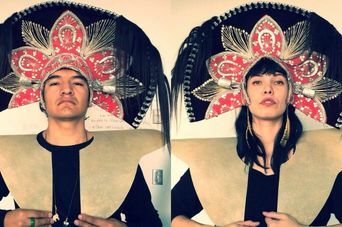 In this collaboration Jeneen and Rodrigo will create two full-body garments that are reflective of their individual Nahua, Mestizo and Gwich’in ancestry. Jeneen Frei Njootli is a member of the ReMatriate collective and has a performance-based art practice. Rodrigo works as a plurimedia artist, activist and picture framer. Both artists are currently based in unceded Tsleil-Waututh, Squamish and Musqueam territory. Jodi Lynn Maracle (Kanien’kehá ne Kenhtè:ke – Mohawk of the Bay of Quinte) is currently pursuing her PhD in American Studies at the University at Buffalo (SUNY). Scholar, activist, dancer, craftswoman and artist Jodi Lynn Maracle centers her research, practice and activism on creating a contemporary presence for Indigenous peoples through critical self-representation across disciplines and across geographies. Most recently she completed a collaborative installation of screen printed signs in the Tuscarora language at Artpark in Lewiston, NY and is in production with its complementary digital soundscape component. Jeneen Frei Njootli (Gwich’in) is an artist and a founding member of the ReMatriate collective. In 2012, she grarduated from Emily Carr University with a Bachelor of Find Arts after working as a Curatorial Assistant for Rita Wong’s Downstream: Reimagining Water project. She went on to hold a Visual Art Studio Work Study position at the Banff Centre, which led to two residencies led by Duane Linklaker (2013) and Postcommodity (2014). Frei Njootli’s practice spans textiles, performance, sound, installation and photography. Her work addresses indigeneity-in-politics, community engagement and productive disruptions. Jeneen will work with artist Rodrigo HGz for the completion of this project. Sage Paul (Dene) is a designer and artist. Her work is a commentary of culture and commodification through fashion, mixed-materials and print. She has exhibited work at The Woodland Cultural Centre (2014), The Royal Ontario Museum (2013) and Harbourfront Centre (2012). Sage is the co-founder of Setsuné Indigenous Fashion Incubator. Lido Pimienta (Wayuu) is a Toronto-based Colombian born interdisciplinary Indigenous Wayuu artist, curator and musician. She has performed, exhibited and curated around the world since 2002. Her work explores the politics of gender, race, motherhood, identity and the construct of the Canadian landscape in the Latin American and Indigenous Diaspora and vernacular. J’net AyAy Qwa Yak Sheelth (Nuu-chah-nulth) is from the Ancestral Lands of the Nuu-chah-nulth on Vancouver Island. She is a cedar bark weaver and textile artist who re-creates oral story traditions on contemporary and re-cultured clothing. J’net has been awarded numerous Canada Council for the Arts grants to venture home to BC and learn cedar bark weaving from kindred weavers. J’net is devoted to retaining and sustaining her oral traditions through a variety of Indigenous textile art mediums for future generations to take pride in their heritage. Louise Solomon (Ojibway) is a goldsmith and is able to bring her large-scale sculptures into wearable art forms of art while also working with more previous materials, such as sterling silver, gold, precious gems and diamonds. Louise chooses to depict the transformation and industrialization of our Mother Earth, which has become the central theme in all her art. Setsuné (set-soon-eh) means grandmother in the Dene language and we use it to acknowledge intergenerational crossovers, blood memory and oral histories expressed in fashion and the arts. The Setsuné Indigenous Fashion Incubator fosters and promotes the research, development and creation of new works by Indigenous artists working in traditional and contemporary fashion, textiles and wearable art. Setsuné delivers programming for the research, creation and exhibition of new works and partners with industry, galleries and allies to encourage a respectful discourse and to promote Indigenous fashion and art across diverse cultures and sectors. Setsuné is a Collective comprised of women artists, designers, managers and community members Sage Paul, Erika Iserhoff and Louise Solomon; we follow the spirit of a not-for-profit organization within an Indigenous framework. Setsuné Inc. is an extension of the Incubator with a focus on the economic development and wellbeing of Indigenous women entrepreneurs who work in fashion, textiles and retail.